Designed by decorator Tom Britt and Valentino Samsonadze, not only is this room absolutely gorgeous, it delivers a 'wow' factor, don't you think? The grand architecture in this living room truly takes this room up a few notches! 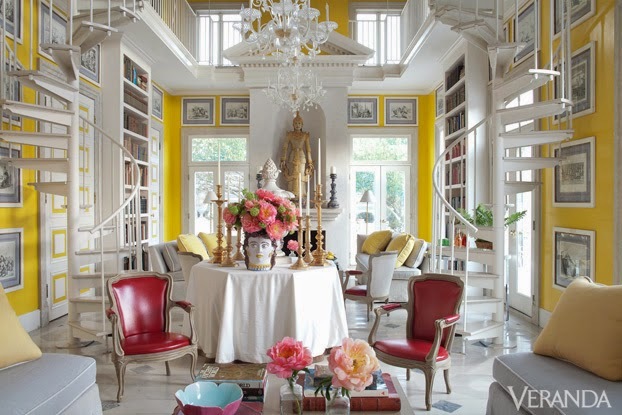 I love how the yellow paint brightens up the room and accentuates the architecture even more! The tall ceilings, spiral staircases, unconventional layout and the architectural details are my favorites! Such a grand and visually exciting space, what's not to love? Thoughts?